and adventure. Just how did one become a knight in the middle ages? The following information leads you through the stages to knighthood. in a barrel filled with sand. to be courteous. The lady of the castle taught a young page manners and social graces. He would learn how to sing, play instruments and dance from the lady. The lady would also teach him to read and write. A priest would give the page religious training and he would often teach the page how to read and write. 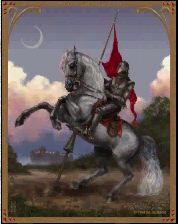 squires fought on the battlefield beside their knight. A squire was responsible for dressing the knight for battles and tournaments. He was the knight's assistant and the only one allowed to help the knight. The squire was responsible for taking care of the knight's armour and weapons. He had to become skilled in the use of the armour as well as the weapons. nature to him when worn. A squire had to become skilled in using the lance, spear, or sword. He had to practice so that the lance did not run back through his fingers when he struck the knight. He practiced against a wooden dummy called a quintain. A quintain was a heavy weighted sack or dummy in the form of a human. It was hung on a wooden pole along with a shield. The squire had to hit the shield in it's center. When hit, the whole structure would spin around and around. The page had to move out of the way quickly without getting hit and knocked off his horse by the weighted bag! When considered ready, generally between the ages of eighteen and twenty, a squire was dubbed a knight. This was often performed by the knight who trained him. On the eve before becoming a knight, the squire confessed his sins to a priest. He was given a symbolic bath and then he fasted, cleansing his soul. Dressed all in white he prayed and kept watch over his armour and his weapons in the chapel all night. The next morning he would be dressed in symbolically colored clothes - red (for his blood), white (for purity), and brown (for the return to the earth when he died). Gilded spurs were attached to his ankles and he was "girded" with a sword. By a tap on each shoulder with a sword, he was dubbed a knight, thus reminding him of his vows he promised to uphold. If a knight broke his vows or was dishonorable, he was stripped of his knighthood in another ceremony to bury him, because in the Middle Ages, " a knight without honour is no longer alive." There were two other ways for one to become a knight. If there was a battle and the King needed additional men, he would knight a number of squires to have enough men to fight. Also, one could become a knight for showing bravery and courage in battle.